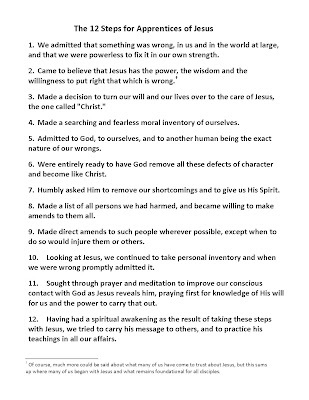 For those that are interested in using the 12 steps explicitly for pursuing Christian growth, here are some resources I can recommend: First, I've been using One Day at a Time by Trevor Hudson. The book is short, to the point, and has had several helpful tips for working each step, which has been particularly helpful with certain steps. I've been working the steps with my friend, John, and he's using Keith Miller's Hunger for Healing Workbook, so each of us are getting exposure to both authors' tips, which have really helped flesh out how to go about each step. Keith Miller appears to be the godfather of using the steps explicitly for Christian growth; I plan on getting his book Hunger for Healing after seeing John's workbook for it. 12step.org is a free online resource that is absolutely fantastic. They give summaries and excerpts from the Big Book of AA, from AA's 12 and 12 and from other recovery groups for each step, scriptural passages for each step, worksheets, etc. Finally, and perhaps most importantly, I suggest doing the steps with another person, preferably someone who has done them with good results. Since neither John nor I have worked the steps before, I frequently talk to other friends of mine who have worked the steps through AA or Al-Anon, to get their input. Remember, the steps aren't a race. I'll be posting the version of the steps I've ended up with in my head, having adjusted them slightly for the goal of growth in Christ, soon.